I was just telling my dad we need to get a golf mat to hit golf balls off his balcony. He lives on the fifth floor of an ocean condo. He wasn't keen on the idea, mumbling something about condo associations and rules... Blah, blah, blah. He has a lot of hang-ups when it comes to having fun and practicing golf. All joking aside, this is a good golf mat if you have a backyard to practice in (and no controlling condo associations). I used to practice a lot in my backyard with full length mirrors strategically positioned directly in front of me and directly behind my target line. I would hit into a net. At least I would try to hit into a net. Every once in a while, I'd miss the whole net and send the ball careening off the side of my garage and then bounding along the neighbor's roof. That's when I would take a break and grab a beer. This Dura-Pro golf mat is the real deal and good for indoors or outdoors. It absorbs those fat shots and is thermally welded so it won't come apart. This is key. (I used to hit off an old ‘Welcome' mat that I found in the garage, and on fat shots the darn thing would fly up at me like a rabid cat.) It also comes with a plethora of free stuff: tray, tees, balls, and free shipping. 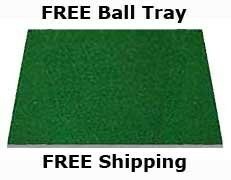 If you want to spend less money, check out the Callaway FT Launch Zone Hitting Mat. You don't get all the free stuff, but it will do the trick. Plus it's a little more compact. Good, say, if you need to make a quick departure from the fifth level of a condo ‘cause some old fuddy-duddy called the cops.